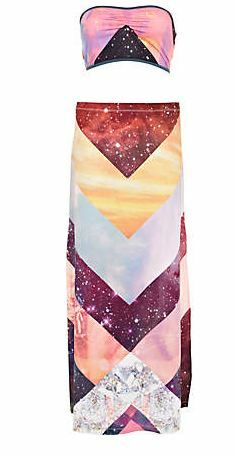 What do you guys think of this Pink Space Print Bandeau Top & Skirt from River Island? I just can’t decide if I like it or not! I might have to see someone wearing it…it seems to require a person who can pull off such a celestial print! The skirt is interesting, but where would you wear this?? I actually really like it! I don’t have the figure to pull it off but if you kept accessories very simple, had dark straight hair, heavy eyebrows ect, I think it would look great. I think the colors are beautiful. I couldn’t pull off an outfit like that myself and I think that only a few body types and skin tones could make it look amazing.